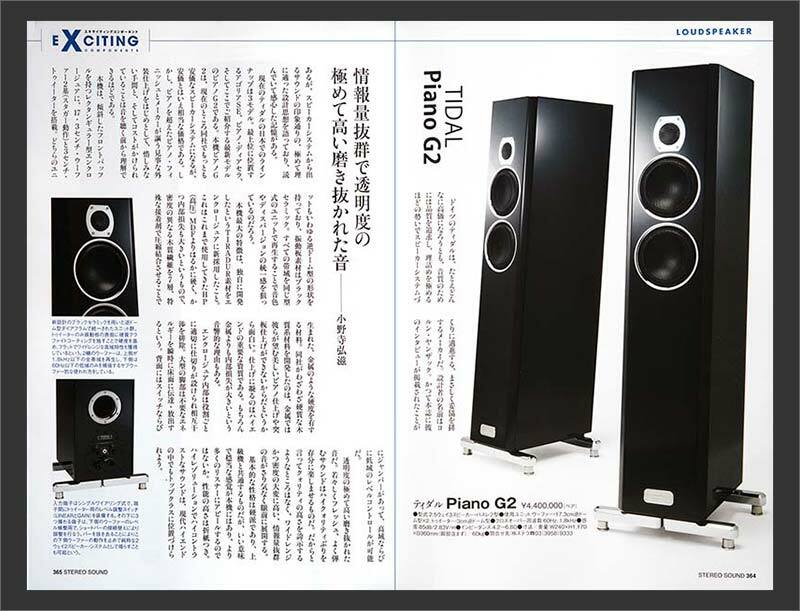 "I wrote up my comments on the remarkable TIDAL Audio system that I heard in the first quarter of 2016 back in early November in this issue. They were quite a rave for this German company that takes elegance and authority to an incredible level. Check out my "Impressions" essay at the link above for details. It will tell you why TIDAL Audio took Brutus Awards from me, with delight. 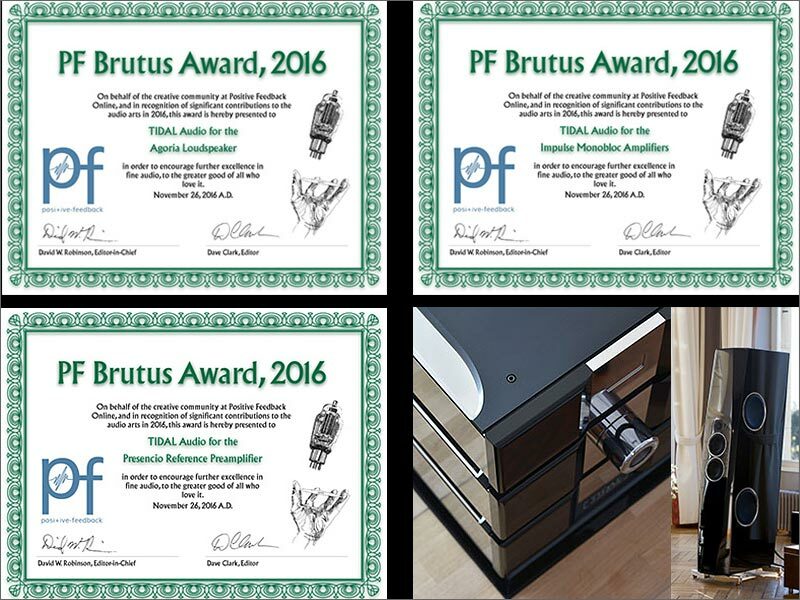 Additionally, the TIDAL Audio system takes one of two of my Circuitus Maximus Awards for 2016. These I give on an occasional basis when I have a system in that provides exceptional synergy. TIDAL Audio has it, for sure." 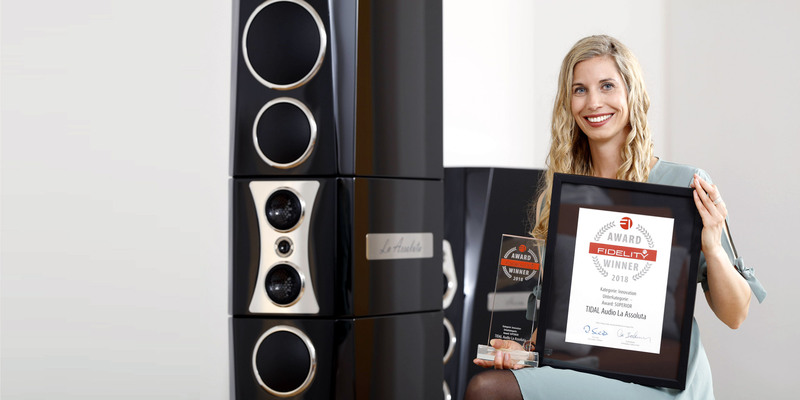 "I’m a fetishist when it comes to the high-end of audio playback devices. I love the very best sound that human beings are capable of offering through their technical, artistic, and manufacturing prowess. What I love, you may not, but that’s why these year-end lists are great, because we all get to gush about what we love best, and the piece of equipment I covet the most this year is the Tidal Contriva G2 loudspeaker. No matter what I heard them paired with at various shows this year, they just spoke to me. They made me emotional, they put off-balance, and kept me there with their innate musicality. Yes, they are expensive, but oh God, they are worth every penny to me." 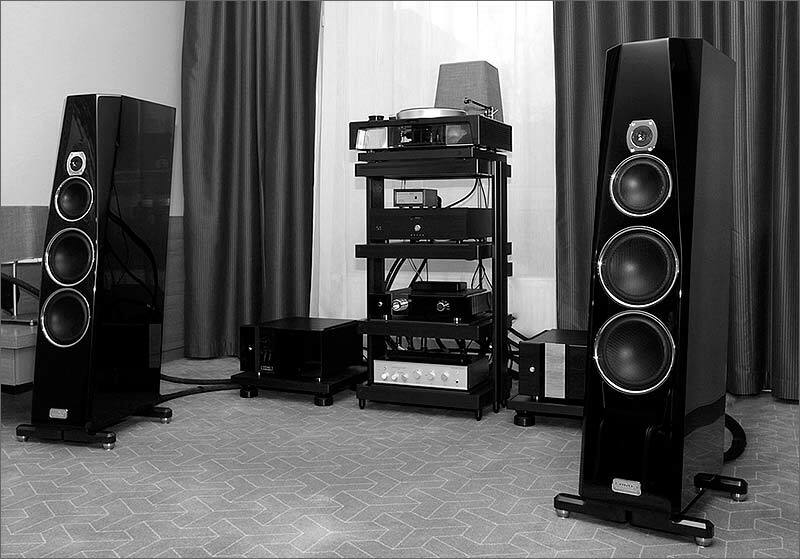 No matter how demanding the sources were that I used with this system, TIDAL responded with immense resolution, solid-as-a-rock reliability, and complete authority of presentation in our room. This is a splendid result, one that merits my highest praise for the TIDAL designs here. I can tell you that I truly regretted the departure of TIDAL; it was a reference experience, without a doubt... And if you have the budget to swim in these rarified financial waters, then you simply must put the TIDAL Presencio stack/Impuse Monoblocs/Agoria loudspeakers on your very short list of top-o’-the-heap alternatives. They are exceptional in every way, and carry my very highest recommendation, with a great deal of enthusiasm." 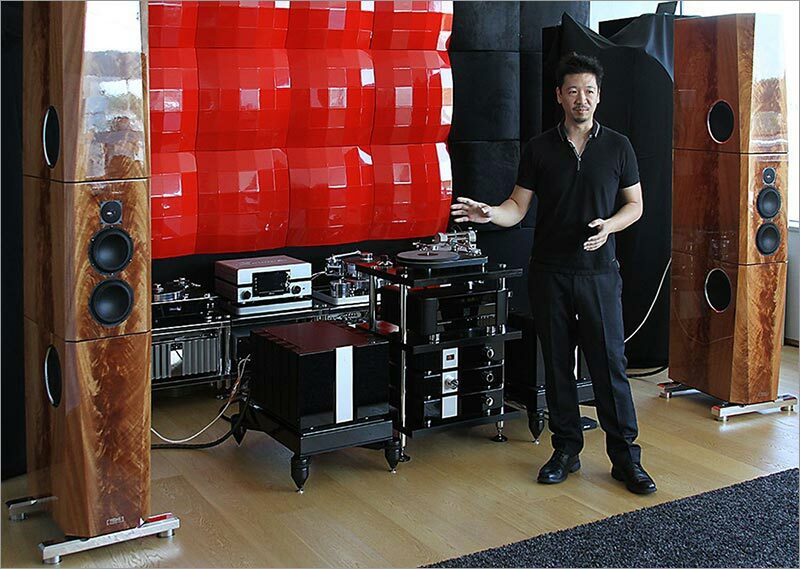 Our US based TIDAL premium dealer Doug White from "The Voice That Is" were presenting the new TIDAL Piano Diacera in cooperation with Zanden electronics from Japan. The Tidal/Zanden/Kuzma combo was visceral, gut-punch engaging, and had lovely leading transients on strings and horn notes, with fat, Sydney Opera House-sized decay on piano notes, along with a more than healthy dose of emotional weight to throw the most stoic audiophile off-kilter. This isn’t a system to analyze or debate the minutiae of which LP version of Norah Jones’ Come Away with Me has more air, and space around her guitar… this is a system to experience music with. All of its beauty, soaring hope, unabashed joy, and heartbreaking sadness. In other words, all the things that make music a part of our lives. A most important part." 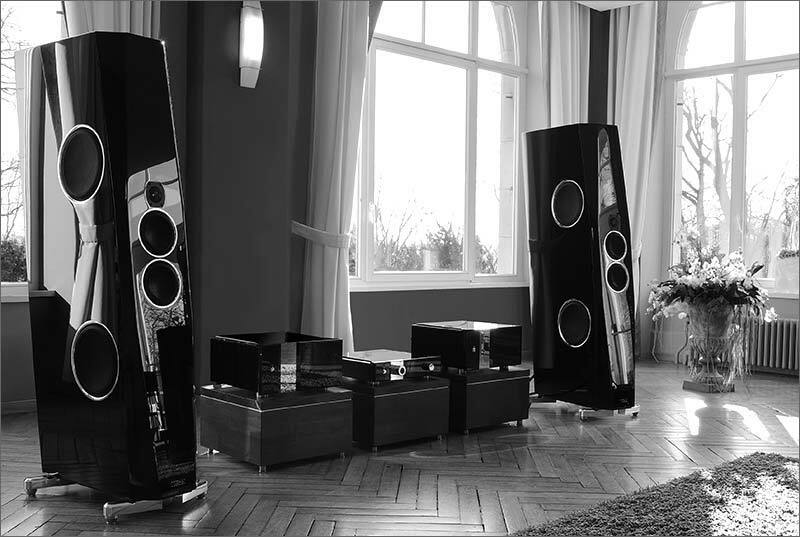 Impressions: TIDAL Contriva G2, TIDAL Preos and TIDAL Impulse Monobloc. As source Helix 1 turntable. TIDAL premium distributor since more than a decade: Mr. Samorukov, CEO of New Ambiance. 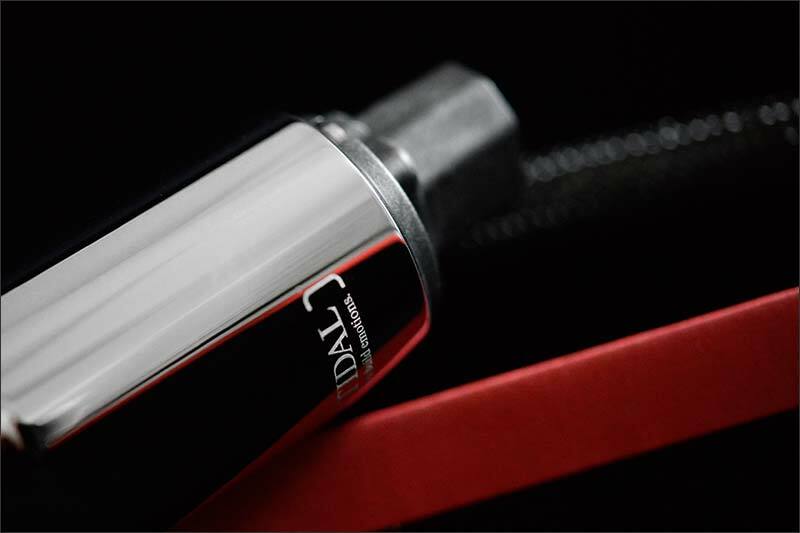 The next logical step and coming very soon: TIDAL reference cables. 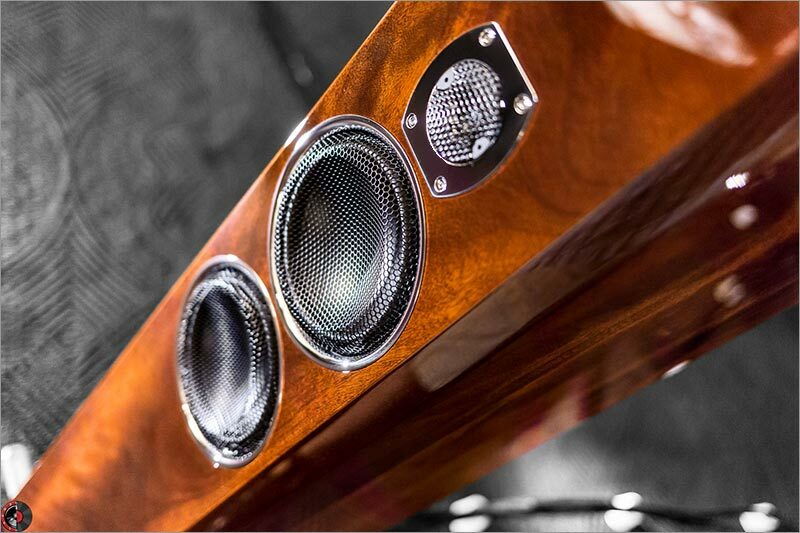 Built like our electronics and speakers the TIDAL cables closes the gap as messenger between amps and speakers. Available as digital cable, XLR and RCA interconnect and power cords. Same philosophy, same built quality, same results such as one knows from us. More information when we launch it officially soon. 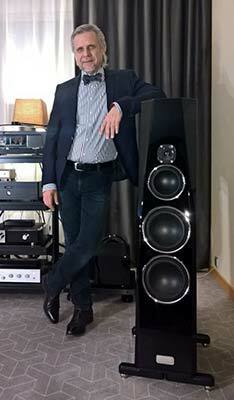 "$500,000 TIDAL AUDIO SYSTEM THUNDERS TO LIFE COURTESY OF ELEMENT ACOUSTICS, WYNN AUDIO"
...while I’m shying away from the technical prowess of this system because it elicited such a deep, and provocative emotional response from me, I will say that the depth, and power on tap here delivered such startling clarity, and undeniable headroom in its sound, that the feeling of effortlessness each note was imbued with was intoxicating to experience. Put another way, Tidal gear forgoes any imposition of character to the sound... It was impossible to not be caught up in the performance because the Tidal gear had the room awash in cello. The sound was massive. Like rough-hewn, creaking, deck timbers on a three-masted ship-of-the-line. It was if the air itself was flexing, and heaving while the boat struggled through a storm surge to make for deeper water, and safety. Listening to gear with this level of swelling emotional weight to its presentation is almost exhausting because of its impact on those parts of our sum that are most delicate, and can betray that which we might normally hide from the public, perhaps even our friends, and family: the heart, the soul, the deep, hidden pools of feelings, and slow-moving undercurrents of fear, regret, longing, passion… this level of playback can dangerously expose those secrets like a yawing pit. You cannot help but be completely drawn in to every nuance by this level of absolute visceral, organic musicality. This is obviously not a system for everyone, and I mean that on multiple levels. Not everyone can afford it, and not everyone wants to be opened up without pause by musical playback. But for those few seeking the ultimate emotional engagement in their listening experience, the system put together by Ku, and Wong offers a glimpse into traveling through what I would consider uncharted music-playback territory. Too many audiophiles (in my experience) navigate these often confusing high-fidelity waters without a map, or even a true destination. And, I’m not talking about the journey of the gear that many of us find ourselves on, rather I’m speaking of the journey of the deeply complex, and often flawed, vulnerable human being that exists inside us all." "...These speakers are warm, full-of-life, and breathtakingly rich in their sound, with a level of detail I’ve not heard outside of headphones. And the sound of a Tidal speaker is entirely in keeping with the elegance and style of the package that the sound comes wrapped it — quite simply, it’s stunning. The Tidal electronics (this is one of those brands that can cover you, soup-to-nuts, if you like) match, naturally, their speakers — well, at least assuming you don’t opt for the veneer — the black on the chassis looks like liquid (it’s a nightmare to photograph), accented by brightly polished silver trim. The knob on the Preos-D preamplifier (which comes with a phono and a DAC) is an unexpected delight — and yes, it’s worth a separate comment all on its own. Assuming you’d dare to turn it — it’s brightly polished silver, so, think “fingerprint magnet”, which is probably why you’ll be using that remote — but when you do, it’s solid, smooth-to-the-turn, and just quietly shouts “quality” at you in that same way that a butler just never would. And best of all, at the other end of that knob is one of the most sophisticated mechanically-isolated digitally-specified-but-fully-analog resistor-arrays that I've come across. WANT." TIDAL proudly announces the establishment of our fully owned Dubai representation as a response to our increasing customer needs in the Middle East and Africa. 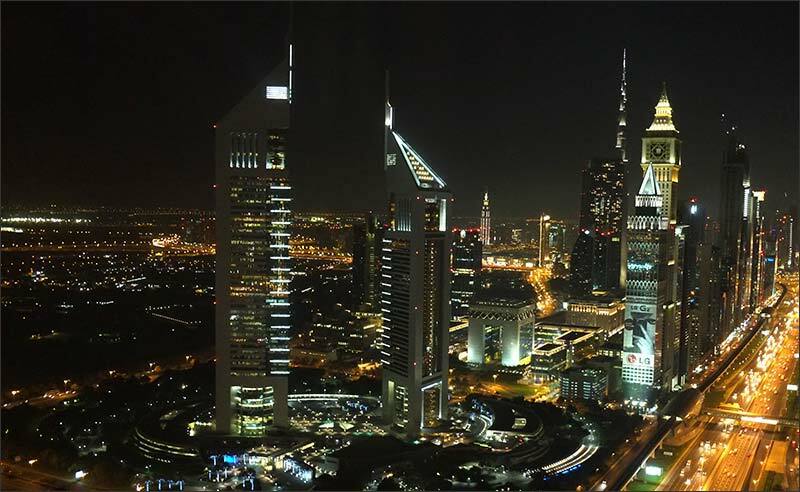 Dubai as a well-known center of gravity for superlatives and luxury is a perfect location to serve our prestigious customers in the United Arab Emirates & all other GCC countries offering in addition an unique operation positioning to service our clients in fast growing African territories. “We are extremely excited about the fact, to now be in the position to quickly respond to our customers’ needs within the same time zone, working week and location…” mentions Joern Janczak, CEO & Founder of TIDAL and Dr. Marcus Schumacher, TIDAL Middle East and Africa adds that “…we see the establishment of TIDAL's Dubai representation, as strategic position to further expand TIDAL's future focus on our prestigious customers towards fast growing India and other adjacent white space Asian territories where TIDAL has not been present till date”. 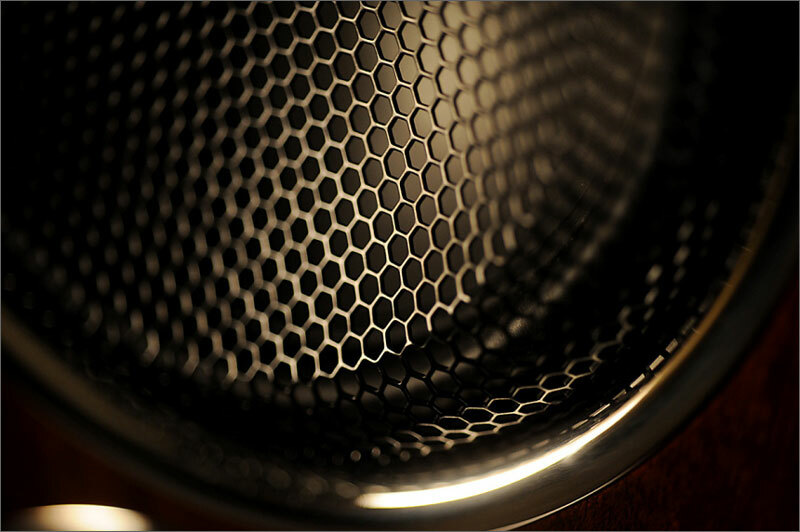 "While providing a huge amount of information, it delivers an extremely transparent and highly refined sound... The piano finish is so outstanding, that you can see how much effort and cost must have been dedicated even before you listen to the sound... Its high-resolution and high-contrast sound is at the highest level in the high end domain of today."